Remember the card previously revealed over the weekend? He’s back. In official digital proxy pog form. AUTO(VC)Generation Break 8:[Counter Blast 1] When this unit attacks a vanguard, you may pay the cost. If you do, search your deck for up to five cards, call them to seperate (RC), and until end of turn, they get Power+4000 and this unit gets Critical+1. Shuffle your deck. 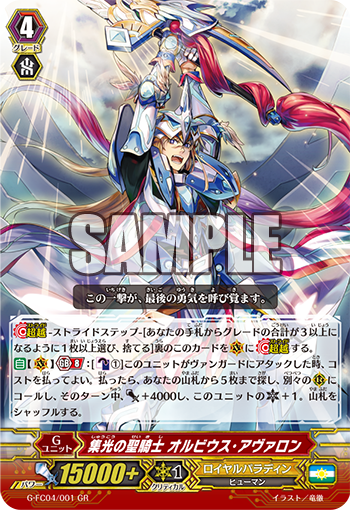 For Today’s Card we’re introducing the 《Royal Paladin》 Generation Break 8 G Unit “Divine Knight of Condensed Light, Olbius Avalon” from the “Fighters Collection 2017” (on sale May 12nd, 2017). “Divine Knight of Condensed Light, Olbius Avalon” is a G Unit that can bring out a great number of allies and strengthen itself and its allies. When it attacks once you’ve achieved Generation Break 8, you can pay 1 Counter Blast to activate its ability. You call up to any 5 cards from your Deck, and all of the Ccalled Units gain Power+4000! And it itself gains Critical+1! It’s quite strong with the fact it can Call any 5 cards when it attacks! By calling the likes of “Knight of Twin Sword” or “Knight of Encouragement, Albion”, you can aim for further continuous attacks. Also, it’s a good idea to call Units that work in combination with other specific Units, such as “Favored Pupil of Light and Dark, Llew” or “Floral Paladin, Flogal”.